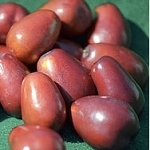 Jujubes, or Chinese dates, are quick growing, beautiful trees with bright fruit and thorny branches. The fruit looks like a small date and has a kernel with two seeds. Buy the bundle with one each of the Li and Lang Jujube trees and SAVE additional $ off Early Bird Pricing.